The Car Barn in Chattanooga was one of the most interesting places that we visited. Selecting a venue for my daughter's wedding is a hugely difficult challenge. I keep saying that I'm glad we have 2 years because I'm convinced it will take me 3. At first glance it seems like the venue would be a better place for a rehearsal dinner than for a wedding. However, a bride can be just as crazy about cars as a groom. 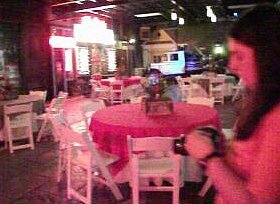 In that case, The Car Barn in Chattanooga could work for either a wedding, reception or a rehearsal dinner. We spoke with a friendly staff person who clearly enjoyed giving us a tour. She indicated that they could handle everything from set-up to tear down. You must use one of their catering companies. The wedding and groom's cake are the only exceptions. I'm attaching a couple of photos from our tour. There are more on The Car Barn website that you'll want to check out. The Car Barn. Aren't they cute? downstairs at The Car Barn. Thanks for sharing the pictures. It is really beneficial to look for wedding reception venues as early as possible to ensure that you get the right wedding venue for your special day.